Tract #1: 10 +/- acreage site in NW Corner; Tract #2: 80 +/- Acres in W 1/2 NE 1/4; Tract #3: 75.5 +/– Acres in E 1/2 NE 1/4; Tract #4: 165.5 +/- Acres in Pt N1/2 Sec 9 = Tracts #1-3 combined. Description: Gently rolling top producing soil type farm with excellent location and access. Farm is dryland with several waterways and also tree outcroppings. Old farm acreage spot located int he NW corner of farm. 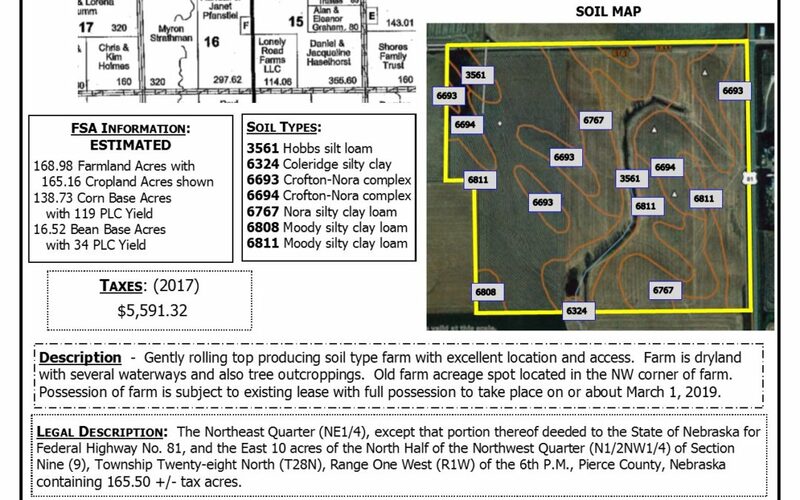 Possession of farm is subject to existing lease with full possession to take place on or about March 1, 2019. 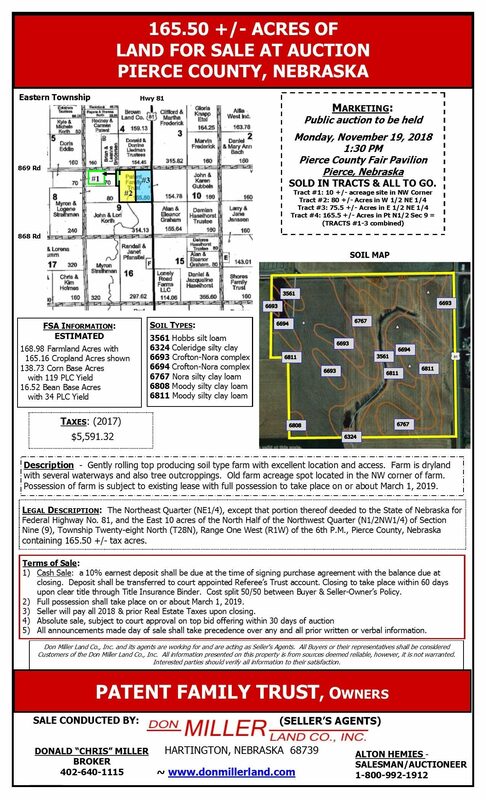 Legal Description: The Northeast Quarter (NE1/4), except that portion thereof deeded to the State of Nebraska for Federal Highway No. 81, and the East 10 acres of the North Half of the Northwest Quarter (N1/2NW1/4) of Section Nine (9), Township Twenty-eight North (T28N), Range One west (R1W) of the 6th P.M., Pierce County, Nebraska containing 165.50 +/- tax acres.